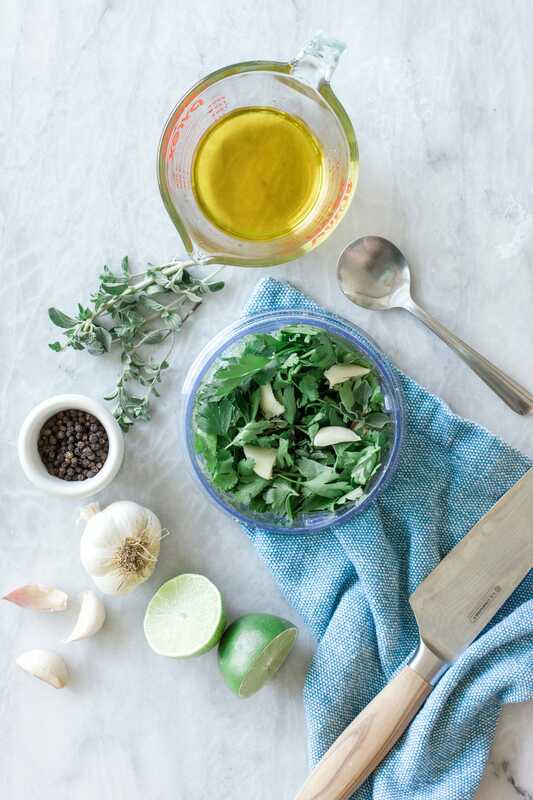 This easy recipe for a traditional Chimichurri Sauce is the perfect recipe for busy weeknight dinners. Chimichurri has a tangy, spicy taste that pairs well with any grilled recipe, but is great to serve all year round. Keep this sauce recipe handy to help take any quick dinner recipe to the next level! By far the best part about BFFF for me is getting to hear from all of you! I absolutely love when you reach out with happy comments, great conversation, and feedback for what you want to see on the site. It totally makes my day! :) One of the most common requests I get from you guys though is for easy meal recipes! And I absolutely get that! We could all use a little more of that in our lives! 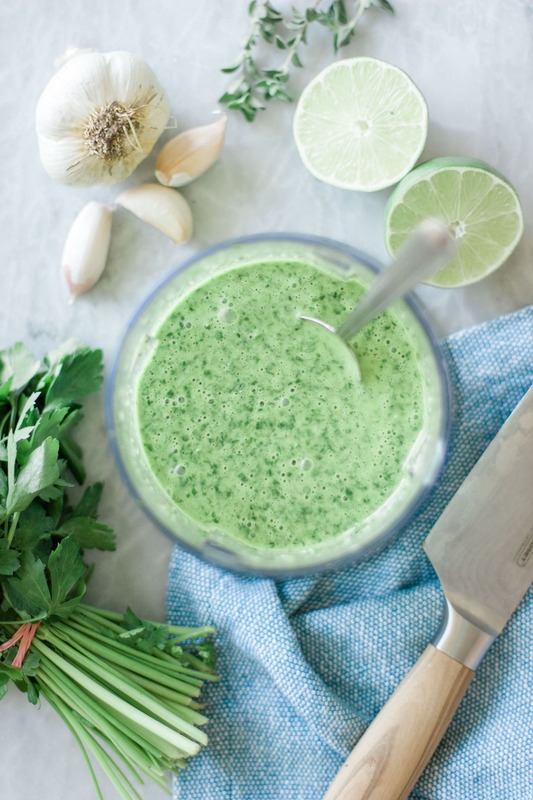 Chimichurri sauce is seriously one of my favorite sauces of all time! It’s so simple, but you end up with this amazing flavor at the end. It’s subtly tangy and has the perfect extra bite to bring out the flavor of most meats. Andy and I will pour this stuff over almost any recipe that involves meat! Especially when you’re grilling plenty of meat this summer and early fall, chimichurri will pair perfectly! You most commonly see chimichurri sauce paired with a grilled and marinated flank steak. If you’ve never had it, then that should definitely be your first stop with this sauce! But it can be used in so many other dishes! Andy and I use it all the time on our grilled pork skewers and it’s amazing! We’ve also tried it on fish and some spicy grilled chicken. It’s so versatile that you can experiment with tons of different combos for this sauce! For a homemade chimichurri sauce, you just need a few key ingredients and a food processor. That’s seriously all it takes to get this sauce going! You’ll need tons of parsley, some oregano, garlic, vinegar, cilantro, lime juice and salt and pepper. How simple is that? You just add all of those ingredients together into a food processor and pulse! You’ll need to keep pulsing everything together until the sauce is completely combined. While pulsing the ingredients, make sure you remember to add plenty of olive oil. This part is super important! The real trick here is to add the olive oil in a continuous and steady stream. This ensures that all of the ingredients are able to stick together into the sauce. Taste your sauce along the way to make sure it’s to your liking too. You don’t want to add too much olive oil and lose the flavor! But it will probably take about a full cup of olive oil to get the flavors just right. As your food processor is running too, don’t forget to scrape down the sides to get every last drop of goodness in your sauce! You’ll know the sauce is ready once the big chucks of cilantro and parsley have disappeared. A classic Chimichurri is smooth but just a little gritty, so all of that flavor stays packed in! Most importantly, give the sauce plenty of time to set in the fridge and combine before serving. A good hour or two and the chimichurri will be pure heaven! I truly love getting requests from you guys and I hope that this recipe is exactly what you were looking for! It’s a great summer sauce an perfect to transition your grilling creations into fall. What are some of your all’s favorite easy sauces? Any of them that you love to whip out to completely transform your dishes? Place parsley, garlic, oregano, vinegar, salt, and pepper in food processor. Process ingredients together until finely chopped. While the food processor is running, add extra-virgin olive oil in a steady stream. Scrape sides of food processor and pulse a few times to combine ingredients uniformly. Refrigerate and allow 1-2 hours for flavors to meld. Never made this before – looks fab! !